Where the Assiniboine River passes by The Forks, a National Historic Site in the City of Winnipeg in Manitoba, Canada, the boats docked at the marina are highlighted from the remaining rays at sunset. The Forks is located where the Assiniboine River and the Red River meet and has become a popular meeting place in the downtown area of the City of Winnipeg. Picture of a marina at The Forks along the Assiniboine River in the City of Winnipeg, Manitoba in Canada at sunset. 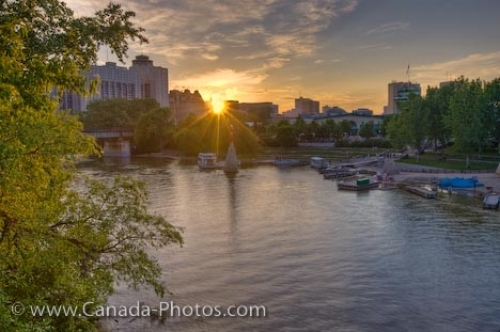 Sunset over a marina on the Assiniboine River at The Forks, a National Historic Site in the City of Winnipeg, Manitoba, Canada.